Deon Lotz is a South African actor best known for his role as Kobie Coetzee in the 2013 feature film Mandela: Long Walk to Freedom, starring Idris Elba, Naomie Harris and Terry Pheto. 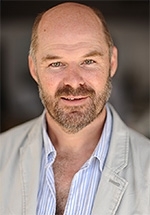 Other feature films he has acted in include Proteus, Hansie, Skoonheid, Stargazer, Winnie Mandela, Sleeper's Wake, Verraaiers, Musiek vir die Agtergrond, Cold Harbour, Faan se Trein and Kite. He has acted in numerous television series including the e.tv sitcom Fishy Feshuns, the science fiction series Charlie Jade and the kykNET drama series Orion and Pandjieswinkelstories.